Richmond, Virginia - The BMC Racing Team led through every time check Sunday on the way to capturing its second straight UCI world team time trial championship. 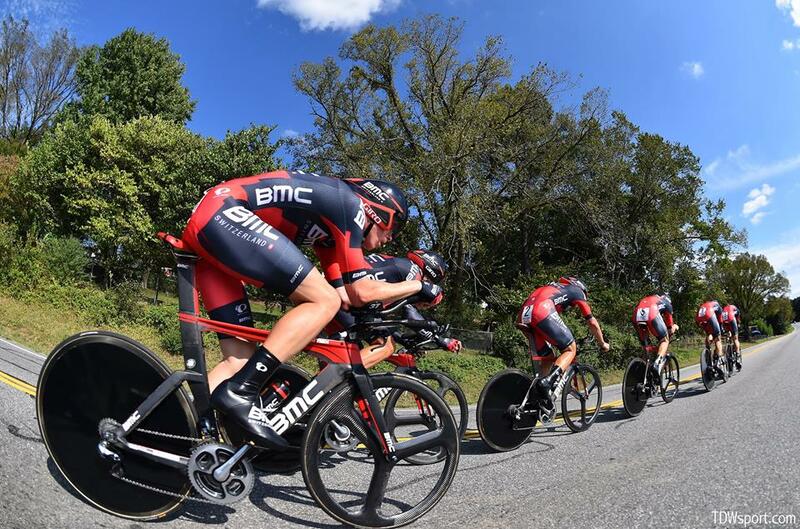 Powering its BMC timemachine TM01s through the streets of Richmond, Virginia, the BMC Racing Team averaged 54.969 kilometers an hour to best Etixx-Quick Step by 11.35 seconds. Members of the winning team were Rohan Dennis, Silvan Dillier, Stefan Küng, Daniel Oss, Taylor Phinney, Manuel Quinziato. 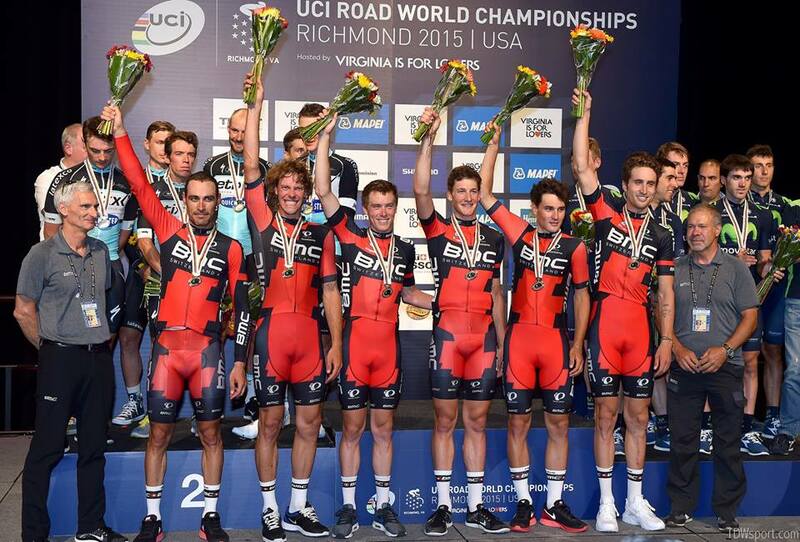 SRM is the official power meter sponsor of the BMC Racing Team. The team trains and races with the SRM Shimano 9000 Training System. Silvan was part the BMC Racing Team’s six man team which included 3 of the other 2014 World TTT Champions (Rohan Dennis, Daniel Oss and Manuel Quinziato) plus former National and U23 World TT champion Taylor Phinney as well as current Individual Pursuit World Champion Stefan Küng. The 38.6km course in Richmond included 240m of altitude gain with a short steep climb in the closing kilometers. 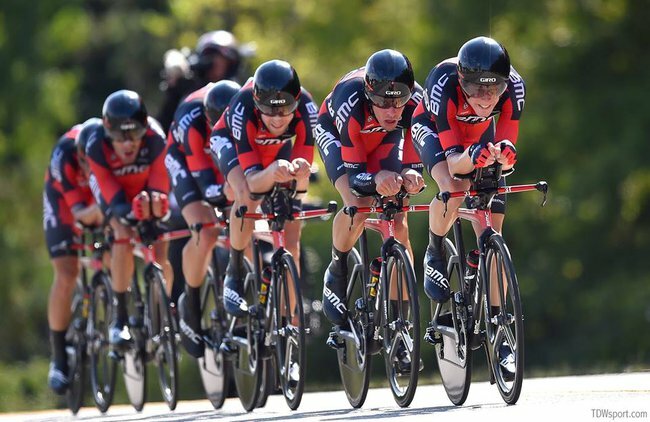 As reigning World Champions the BMC Racing Team had the honor of starting last and topped the intermediate time splits throughout the race gaining up to 13 seconds on their closest rivals, Etixx-Quickstep. Silvan started in 5th position behind Taylor Phinney and was one of the final 4 riders counting for the team’s winning time of 42 minutes 8 seconds. The team averaged ~55kph and Silvan achieved a maximum speed close to 80kph during the race. His average power output was 396W but this doesn’t necessarily give a clear picture of the demands of a team time trial in which power output distribution is more polarized above and below a rider’s threshold. For example, he spent a total of 15 minutes over 500W, achieved mainly during his turns at the front of the pace line where a rider contributes to maintaining the speed of the team for periods ranging from 20-60 seconds. For the remainder of the race Silvan’s power output varied at or below his threshold power depending on his position in the pace line. Most impressive of all was that Silvan attained his peak 1 min power output of 540W on the final climb before the finish ensuring the team didn’t lose any time and were able to retain their World TTT title. SRM insight provided by David Bailey, PhD - Sports Scientist and Performance Coach for BMC Racing Team.